The Professional Regulation Commission announced today, July 18, the official results of July 2014 Forester Board Exam. 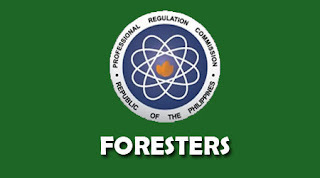 PRC released the 345 out of 856 who've passed the Forester Licensure Examination given by the Board for Foresters in the cities of Manila and Davao. The Board for Foresters chairman is Monina T. Uriarte, who gave the licensure examination together with the members, Jose A. Lorenzo and Gerardo T. Cabreros. July 2014 Forester board exam results released in two (2) working days after the last day of examination, according to PRC. View here the Top ten (10) passers of Forester Board Exam. For the meantime, please kindly bookmark and visit this page, like our Facebook page, follow us on Twitter, add us on Google+, and/or subscribe to our daily news feed via RSS or Email. Comments or suggestions about "July 2014 Forester Board Exam Results - Forester List of Passers" is important to us, you may share it by using the comment box below.